Hello sweet friends! The Thanksgiving Holiday here in the US is over and that means the Christmas season has officially begun! 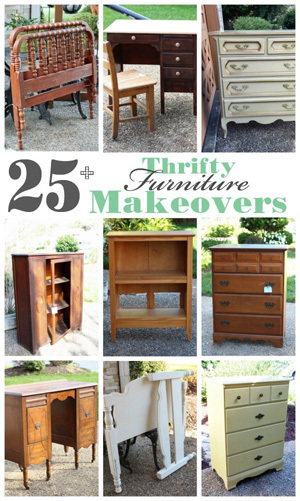 I’m kicking it off with a super simple makeover. 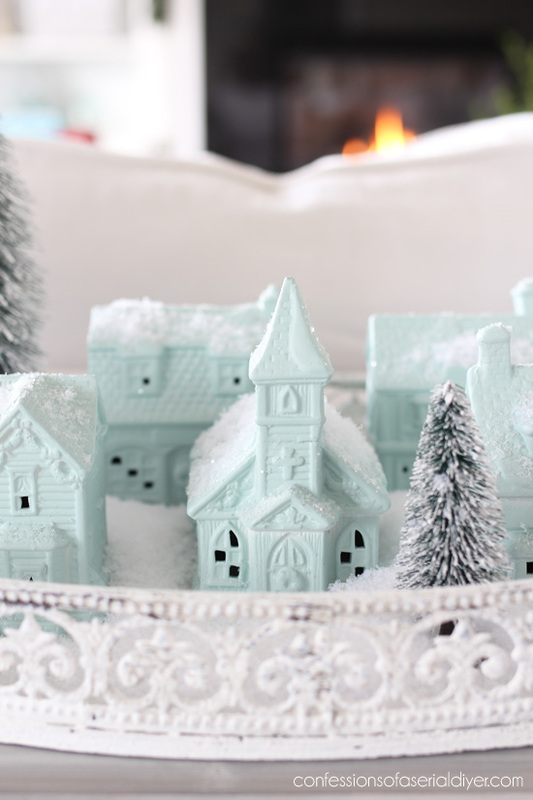 It’s no secret that I love all things Christmas village. 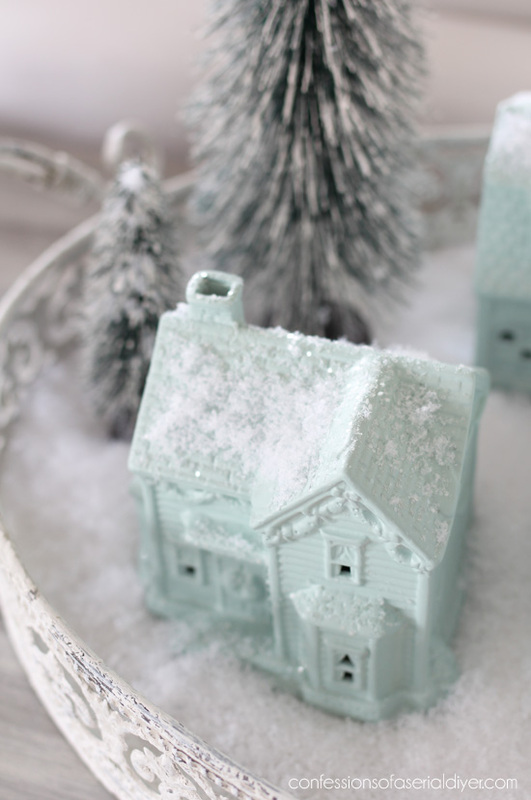 You can visit my treasured Christmas Village collection HERE if you like. One of these didn’t really match the others so it’s not pictured. You already know that I planned on painting them, right? Why not? 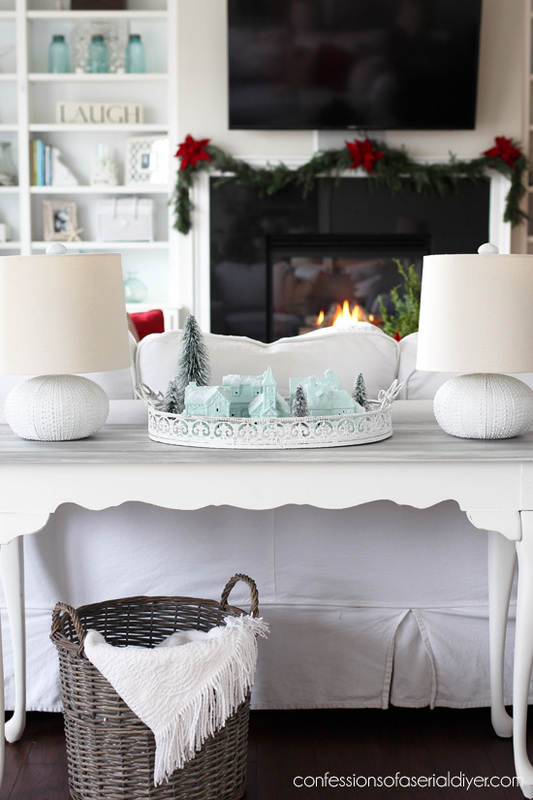 Add a little glitter and voila…Christmas coastal style! 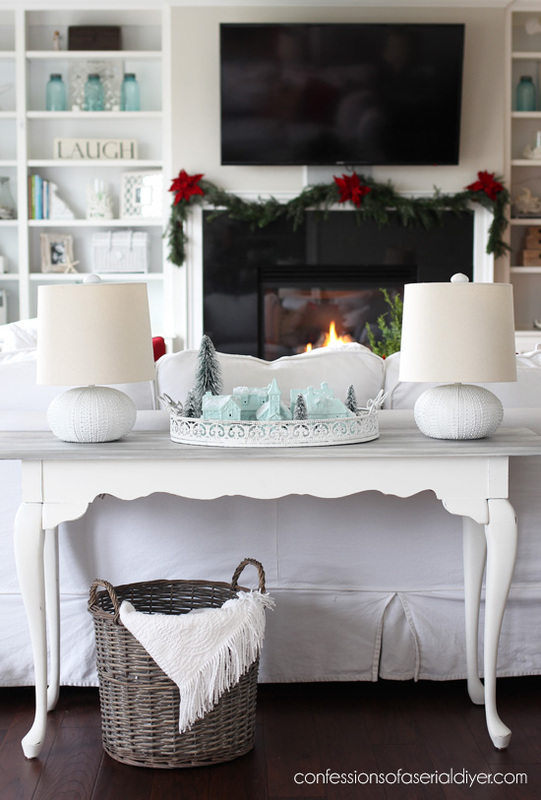 You could paint them any color that inspires your Holiday decor. 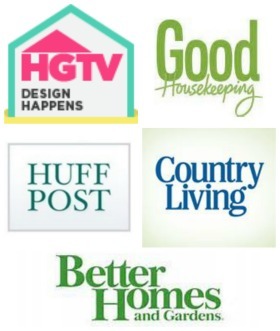 I’ve included a few affiliate links so you can find the products I use. I only added a dusting of glitter from above. You can find it HERE as well. It’s super fine and so realistic. 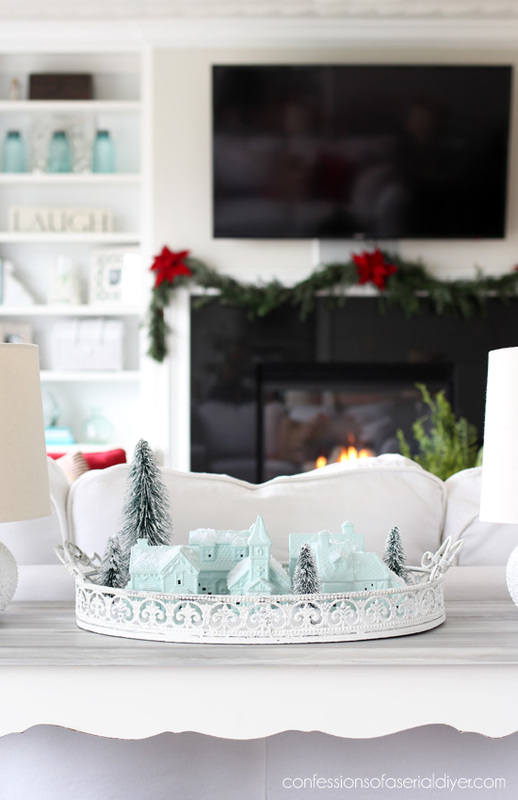 I haven’t added any holiday decor to my built-ins yet, but I did add a few things in here. So my Hubby makes a Christmas video each year that includes all parts of the Holiday season. This year he wanted something new and different to include in his video. Since our neighborhood is right behind the nursery where we purchase our tree, he suggested we bring our tree home in a wheel barrow. Dead serious. “It’ll be an adventure!” he says. Do you see the size of our tree in the background there? I was up for it for about a day, but when Friday came and it was freezing cold out, I vetoed the idea. He was really bummed. Can you imagine the look on the guy’s face at the nursery when we pull up with a wheelbarrow for him to load it in? If the weather is more mild next year, I don’t think I’ll get out of it ha ha. I found the trees at Walmart, sold individually. 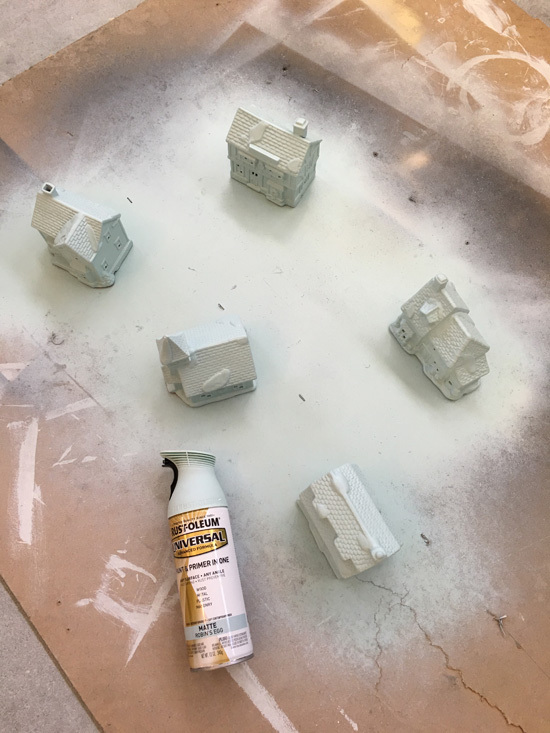 The dollar store has similar houses every year if you wanted to create your own painted village! 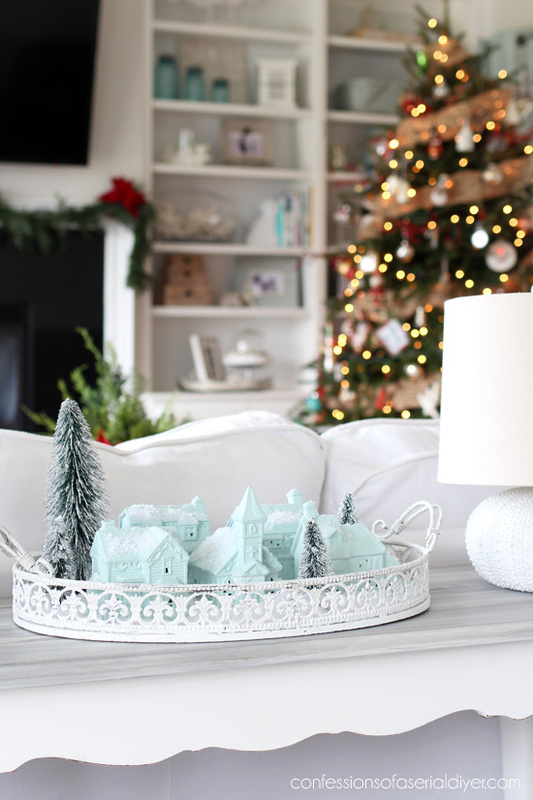 Have you started decorating yet?? 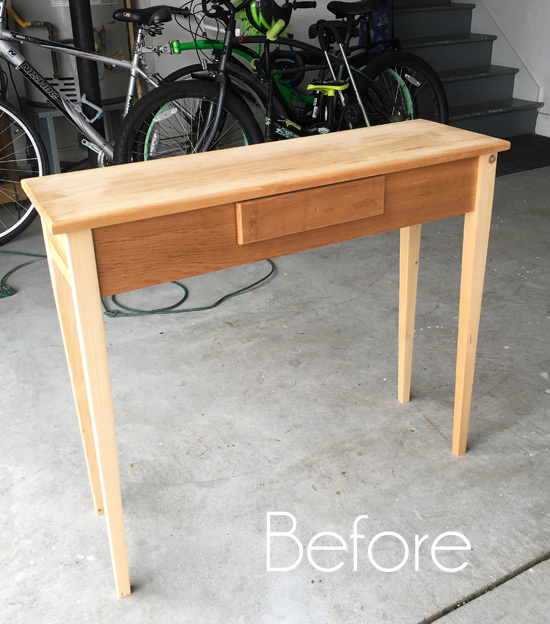 UPDATE: See how this table turned out HERE now! That is so cute, not to mention easy, and who doesn’t Love easy this time of year? I will have to watch my thrift store to find my own mini Christmas village. Thanks for the inspiration!! You constantly surprise me with how good you make things look 😮 🙂 I honestly never would’ve thought to paint those things – and I’m known for painting anything!!! Love it. I had a feeling you were going to paint them but I wasn’t expecting blue! They turned out so cute! I would have never thought of painting the village houses this beautiful color but love them. Would have loved to have seen pictures of you and your hubby with a tree in a wheelbarrow. Maybe next year. Your Christmas tree is stunning. Enjoy the rest of the week, stay warm and I look forward to the table makeover. Can I just say how I loved how you showed each step and where you purchased your items? Loved the village and what you did. Did you say where you purchased the trees? I really like those houses painted all one color. Yours are cute, coastal style. Funny how the details show up more when all the colors aren’t in the way! Your story of getting the tree in the wheel barrow is hilarious – I don’t know how a tree that size would work. Seriously hope next year you get to it! Lol. Yep, all decorated and ready to jump into the season. I don’t Black Friday shop, instead I spend the day decorating! What a great idea, Christy! 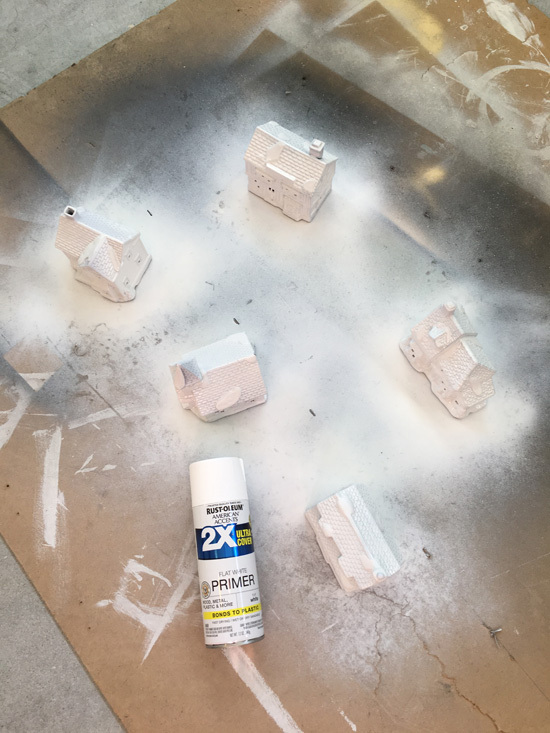 I spray paint everything but have never painted any Christmas decor. Probably because it’s too cold to paint outside! But now I will look at my Christmas decor in a whole new way. Thx for the inspiration. It looks great! Can’t wait to see what you do with the rest of your beautiful home. Love the wheelbarrow story! Wonderful transformation! 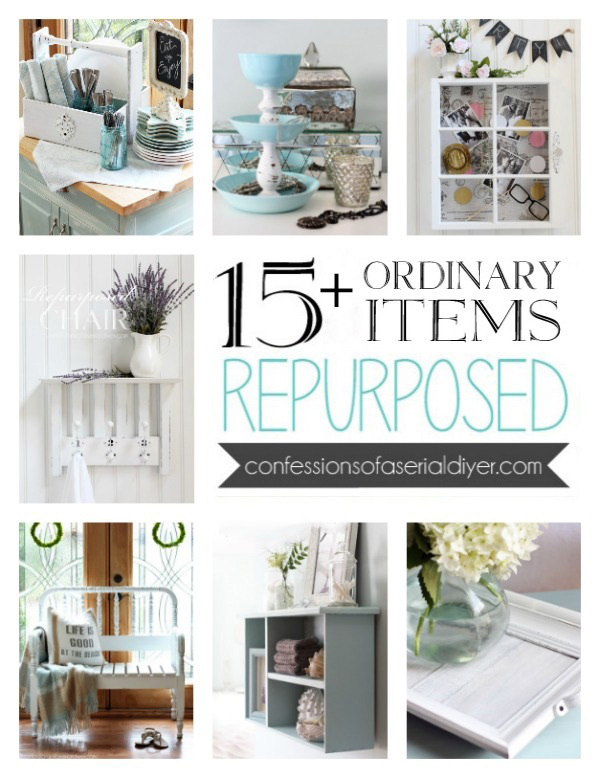 They were awfully bad looking before but I love how they tuned out…thanks for sharing! I love this. So clever! Aww, that’s so pretty! I did the same thing for a Halloween village, only black of course. I didn’t use a tray, though-that’s a great idea! 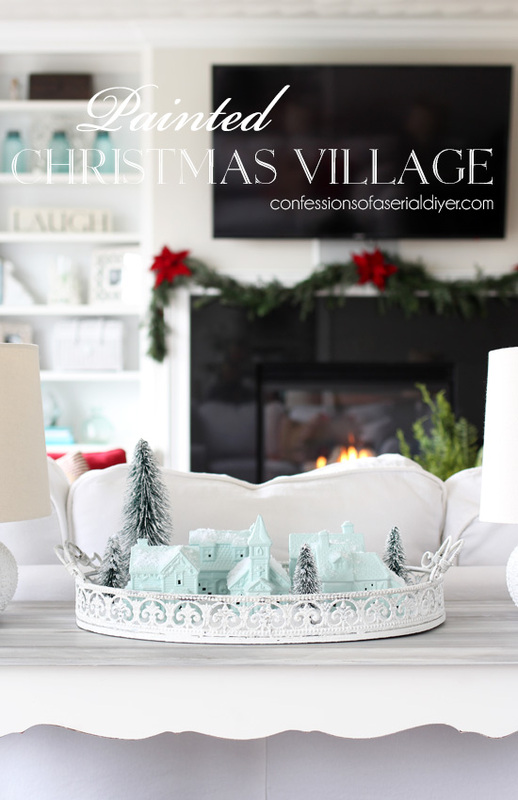 I’m always wanting to put out my village(s), but it’s so much work; think I’ll try a tray this year! TY!! Very cute! I love the wheelbarrow story. I say go for it next year (weather permitting)! Very pretty. At first I didn’t think I would like them all painted the same color and no red and green?! However, they look very soft and elegant. That is GORGEOUS!!! I love the blue! And no fair, our stores all seem to want to charge more like $6 A PIECE here. I’ll be keeping my eyes open for the rare deal though, cuz this is beautiful! Hi Christy! I did just did the same thing! 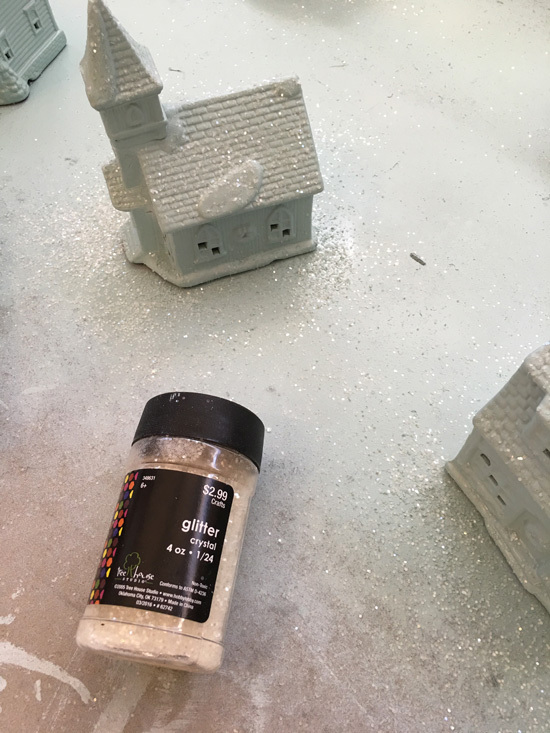 I bought the village at Goodwill and painted it white with glitter. They say great minds think alike! Absolutely adorable! I see those little houses here and there at second-hand shops, so I know now I need to collect a similarly-sized set. 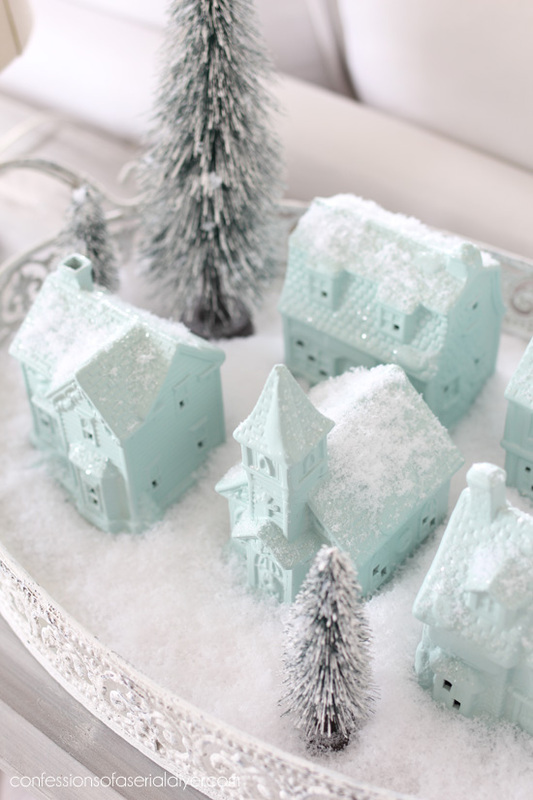 The robin’s egg blue is just perfect! It gives me that warm holiday spirit looking at it. So pretty!!! I’m doing something similar this year but I can’t decide what color, these are so beautiful!! I absolutely love this redo!!!!!! I have so many churches and stores and people and animals. I will have a whole new village!!! 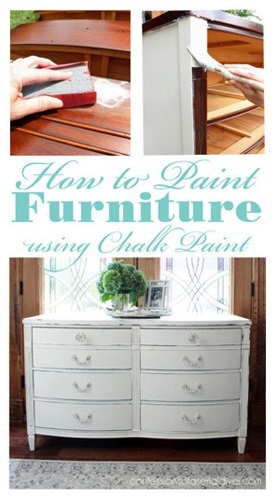 I want to do this with a prim/farmhouse/country/cabin feel. Do you have a color recommendation? Love them Christy. You have the best DIY ideas!! I think I’d share your view of hubby’s Christmas tree in the wheelbarrow escapade, but it would have been funny to watch. Very cute! Our tree is going up this week!! I love my Christmas Village. Last year for the first time my 20 year old granddaughter put it together. It was so wonderful to have the extra help and to see how she invisioned it. One day it will all be hers. Absolutely Beautiful! I never would of thought of this and now I pulling my out of storage and painted them. Thank you so much for this awesome idea! Oh wow! I love what you did with that village. You are so good at what you do and you seem to have some of the same tastes as me. Isn’t it great when you can see something and know that you make something amazing? Thanks for sharing with us! Wonderful job on that village, it looks amazing. I LOVE these!!!! I never really felt the urge to have a village…tooo busy with all those colors. Now I am crazy excited to go down to the Goodwill and get some ….they are always there. In fact I passed some up last week…..hope they are still there…and hope nobody reads your blog around here!!!!!!!!!! hehehehe…. what a wonderful improvement! I love the color and the glitter! I would never have thought of this (until now)!!! Ah, you did it again, Christy! 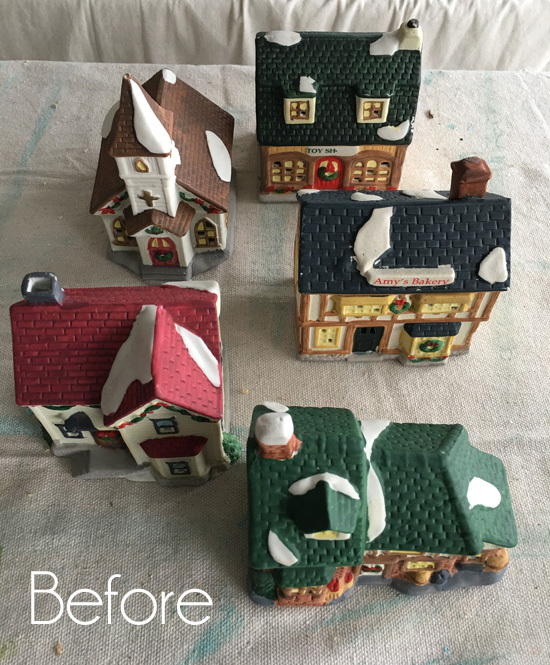 Now I have to go to Goodwill for some old Christmas village houses! Ha ha. This turned out beautifully! Great job. The blue is a pretty color, but there is no more detail on the buildings. Sorry, but I think I liked it better before. Christy that is beautiful and so is your home!!! I love the white and the snow on top is perfect! Happy Holidays! They’re gorgeous and darling the way you did them! The only thing I would have done differently is handpaint the snowy portions on the roofs (pearl white) but I’m a bit of a nut for fine detail lol. Thanks for sharing! New ideas are hard to come by….but you just gave me one. Thanks. OMG I have tons of these little houses that I have been converting for a long time. Mine will be white with the icicle look to the tops. Last fall a lady came to a yard sale I was having and saw a couple of my houses and said I have a huge collection of these and I think they are all outdated now and I don’t know what to do with them. I said come in here…I took her in the garage and showed her that I was doing mine all white and she loved it so much she said she was going right out to get the paint! She told me I saved her a lot of money…lol. She sure seemed a bit baffled at first but when she realized what I was doing she just couldn’t believe it…lol! I really never thought about doing anything but white but I really like the color you picked as well. It’s certainly different! Prodigal Pieces shared your project and linked to your site this afternoon. I was so in love I decided I was going to go store to store until I found some. The local thrift store had ONE for 2.99. I tried Goodwill, Dollar Tree, Tuesday Morning and then …Walmart had some for 1.92 each. Score!! Thank you so much for posting this project and sharing it with us. 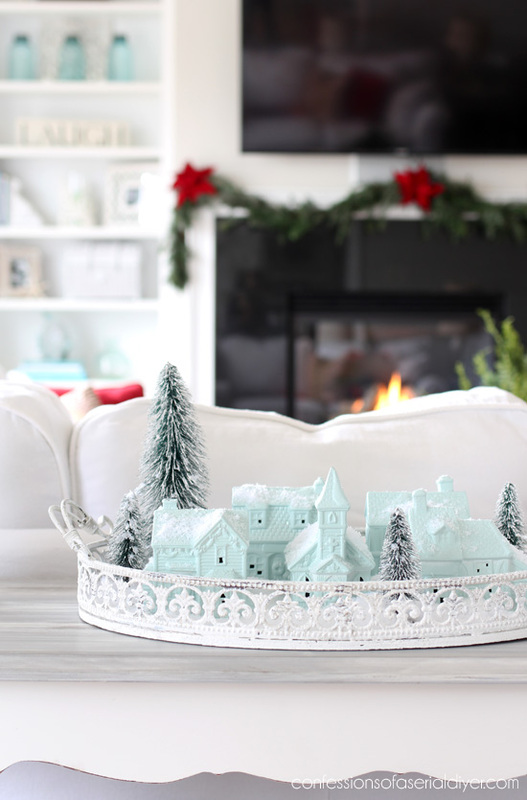 It is so adorable and I’m hoping my walmart village makeover comes out 1/2 as sweet as yours. I went to my local Walmart today and the only ones they carry are larger, more expensive houses starting at around $8.00. Oh darn! Maybe the dollar store? Just popping back Christy to say thank you for sharing at Create, Bake, Grow & Gather this week. 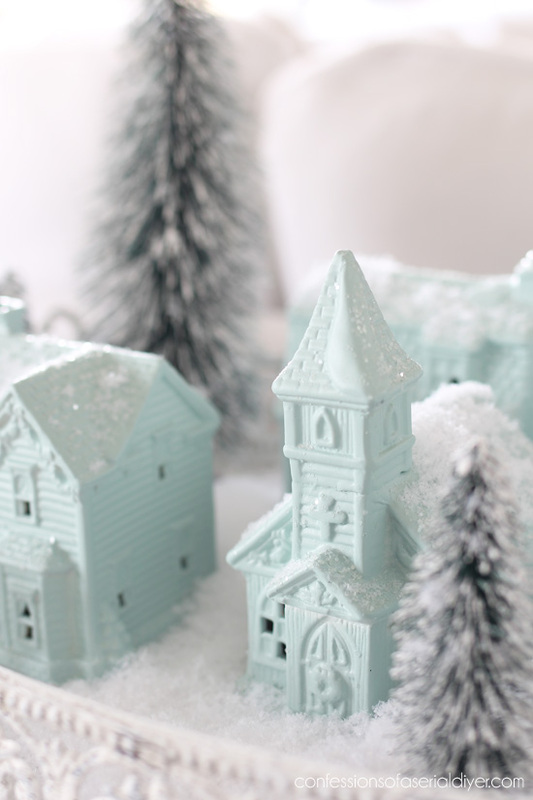 I’m delighted to be featuring your sweet little blue village at tonight’s party and pinning too. 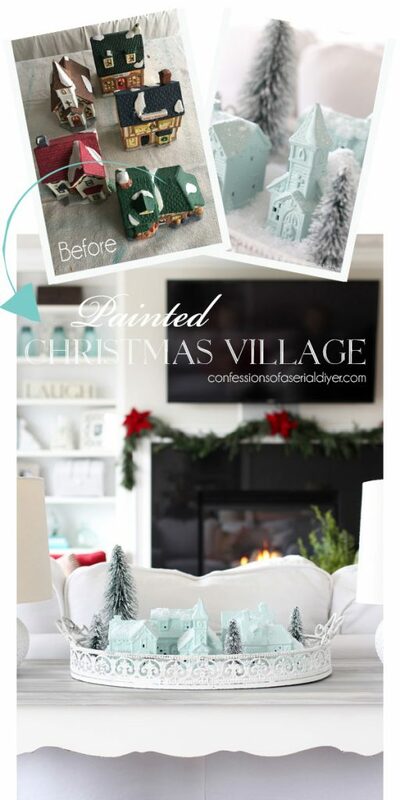 I just love your little village and after seeing this article the other day, remembered I had seen some village houses like yours at a local curio shop last week. I passed on them but after reading you article, beelined it back to the shop yesterday….score! I got 7 different buildings for $3.00! 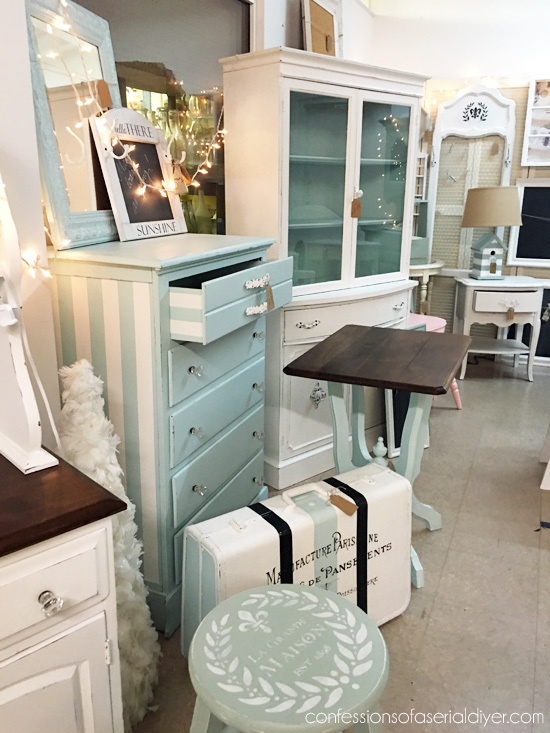 I love the pale blue color…..do you think pale pink would look good.too? I’m so excited to start my project! Thanks for a wonderful idea!